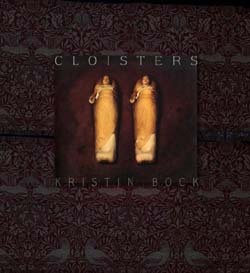 Kristin Bock (Poetry Fellow ’06) recently published the poetry collection Cloisters, winner of the Tupelo Press First Book Award. We spoke to her about her new book and her art (literary and otherwise), and the conversation ranged from Pre-Raphaelites to stealing her father’s apprentice to the benefit of ungentle critiques to writing about a Space-Age Paul Bunyan. Enjoy! MCC: Reading Cloisters, I kept jotting down language I loved and found my page filled with it – “I lay my head like a hive in your hands” (from Phrenology); “Inside my chest an apple darkens” (from Scarecrow); “Clearly, she’s ruined./Her face an overripe peach,/her hand a blowzy peony” (from Watercolor Left in a Humid Kitchen). I read Michelle Blackley’s review and was curious to see that my reactions, while equally favorable, were very different from hers. Have any responses to your writing really surprised you? Kristin: Yes, but pleasantly so. Blackley focuses on the interconnectedness between Nature and the unrequited desires of the speaker. In its early stages, a writer friend of mine labeled the book a “re-appraisal of the Pre-Raphaelite Brotherhood.” At first this surprised me, but when I thought about the book’s emphasis on the imagination, nature, symbolism, and the divine, and how many of the poems were inspired by Pre-Raphaelite art and philosophy such as The Romantic Sublime, and The Artist as Rossetti’s Sitter, I realized the collection could be read that way. Certainly, the Pre-Raphaelite movement had a significant influence on my writing, and once I embraced this idea, it helped to shape the rest of the book. Aside from its themes, I’m always pleased to hear that people are enjoying the language itself. Like you, many say they like the terse, imagistic quality of the lyric. It’s all in there I suppose, and listening to readers unravel various threads has been enlightening. MCC: I’m fascinated by your choice to group the poems into five “months” – October, December, February, April, August. It was interesting to see how some of the imagery carried through the different sections, like a cast of characters (bees, birds, apples, bones) set in different landscapes. Was the grouping into months something you had in mind while writing, or a structure that emerged along the way? Kristin: The structure of the book attempts to document a year of estrangement from a friend. The speaker of the poems struggles with the idea of letting go and resists grief, as if completing the process would mean some form of forgetting which is unacceptable. Nonetheless, the book is divided into sections which loosely mirror the five stages of grief: denial, bargaining, anger, depression, and finally a kind of acceptance, or in this case – forgiveness. Because most poems are set in the New England landscape, I found they reflected the passing seasons and fell naturally into sections. I think the repetition of certain images or a “cast of characters” comes from my propensity to see the world, especially the pastoral, in terms of symbols. I didn’t consciously set out to write “symbolic” poems, however, after I wrote about 20 or so, I began to notice the ubiquitous bird and apple and bee, and once I did, I let them evolve and take center stage. MCC: I know, apart from your poetry, that you’ve worked with your husband (Geoff Kostecki) to refurbish liturgical paintings and sculptural iconography. I’m curious whether this work finds its way into your writing. I’m thinking of – and I apologize if this reading is too literal! – the poem Restoring the Fourteen Stations of the Cross. Is there overlap? When I was older, and to my father’s dismay, I stole his one and only apprentice and we married. The restoration work I do with my husband finds its way into my poetry much the same way my father’s did. I guess you could say it was an easy transition! You’re right; the poem Restoring the Fourteen Stations of the Cross is the best example of this cross-fertilization. While refurbishing fourteen very large stations in bas-relief for nearly a year, bending over the figures, mending their broken limbs, sanding, scraping, painting them, becoming intimate with each scene and its symbolism, I had the sensation of literally being the hand that created them. Therefore, the speaker of the poem emerged as the voice of God. Similarly, the poem Washing the Feet of Crucifix was written while painting a life-size figure of Christ inside a mausoleum. I found myself on my knees washing the feet of Jesus. As a former Catholic, myth and idolatry are ingrained in my psyche, and like it not, they still have a hold on me. Fortunately, tending to the idols of my childhood has been strangely provocative. There is a tenderness involved, an intimacy, and certainly a blasphemous thrill too (I often have to refrain from painting Mary’s toenails red). I believe it was T.S. Eliot who branded himself a “Doubting Believer,” and it’s that inner conflict that keeps me interested in the work and makes rich fodder for poems. As far as the title is concerned, a cloister is a part of monastic, medieval architecture. It consists usually of four corridors with a courtyard in the middle, intended to be both covered from the rain, but open to the air. While most poems in the book are pastoral in setting, albeit enclosed pastorals such as bower meadows, the hermetic vision of the speaker leads us into the interior of the Self. Cloisters served the primary function of quiet meditation or study gardens. In this way, I like to think of each poem as a cloister, a place that offers regeneration through Nature, devotions, reflection, and solitude. In this respect, my work as a poet and as a restorationist is similar in its aims. MCC: In an interview* with fellow Montague poets Chris Janke and Elizabeth Hughey (who won a poetry fellowship in 2008), you mentioned that you have found a thriving poetry community there in Western Mass. Do you still meet with a writing group? What makes a group like that work? Kristin: I owe a debt of gratitude to my writer’s group for their role in Cloisters‘ publication. I wrote the majority of the book in 2004 and sent the manuscript to about 15 contests, placing as a semi-finalist in one of them. My group gave the manuscript a stiff haircut and I got busy revising it. When I sent the manuscript out a second time, I placed 12 times as a semi-finalist and won the Tupelo Press First Book Award. Not surprisingly, I’m still meeting with my group and their presence in my life as poets and close friends is invaluable to me. I believe what makes our particular group work well is our respect for each other as poets and people. Just as important, our critiques are not gentle. MCC: What’s next for you? Kristin: If my husband had his way, I’d convert completely to a painter and we’d spend our nights sleeping on scaffolding in dark churches. I’m still doing restoration work with him, but lately I’ve been sitting for a series of portrait paintings inspired by Dante Gabriel Rossetti’s work and the imagery in Cloisters. It’s our first official collaboration. 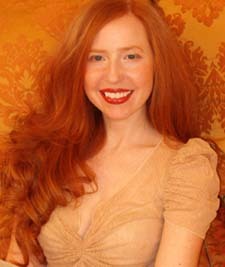 Kristin Bock’s poems have appeared in many literary magazines and journals, including Cream City Review, The Seattle Review, Prairie Schooner, The Black Warrior Review, and FENCE. Cloisters is her first book. * Incidentally, the interview with Kristin, Liz Hughey, and Chris Janke was conducted by Andrew Varnon, who won an MCC Poetry fellowship in 2004.